"This vegan pancake recipe is the best of the vegan lot. The secret that these pancakes are not soggy like the other vegans ones is that it uses custard powder. 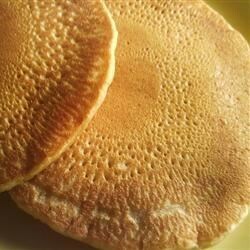 This ensures the pancakes are cakelike and taste and look exactly like non-vegan pancakes. Mix fruit into the batter if you like. Serve hot with syrup or jam." Doesn't custard powder contain egg? When you add more milk (about 1/2 cup at least), these really are the BEST vegan pancakes we've made! No custard powder to be found here so we subbed the equal amount of vanilla pudding mix. I forgot to add that the batter thickness is up to one to decide.